These were computers in only the most pedantic sense, more accurately described as models of computing principles which demonstrated logic gates, binary numbers, simple decision-making, storage and retrieval of numbers, and similar concepts. 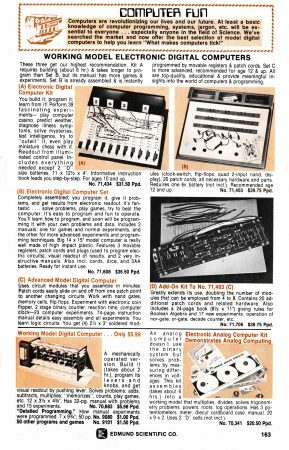 Real computer components – processors, memory, displays – were not quite on the market yet, but these gadgets could whet a fellow’s appetite. Really, it wasn’t much, but it was a start. The most popular of these devices is pictured at bottom left. (Click the picture to zoom in for closeups of all 6 devices). Known as the “Digi-Comp”, this plastic toy had been produced since 1963. The analog computer at bottom right was a final branch of early computation devices. Both it and the top models were also available in versions from Radio Shack stores. 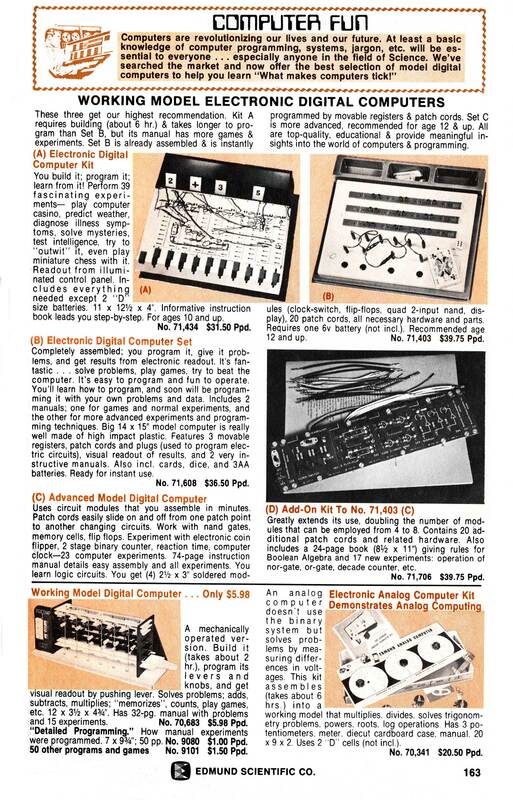 The circuit boards in the center appear to contain actual integrated circuits devices, and so are priced accordingly at $37 and $40. 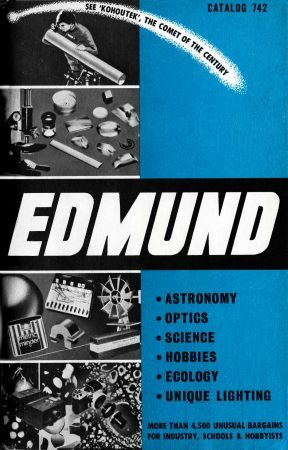 Edmund Scientific was a marvelous Johnson’s Novelty-like catalog for science geeks: all sorts of scientific and pseudo-scientific apparatus, much of it surplus, all intriguingly described and attractively priced. This 1974 catalog featured telescopes for watching the “Comet of the Century”, new low prices on calculators (now $79 instead of $200), and all manner of lenses, magnets, and “unique lighting” (for psychedelic rock light shows) Edmund still survives in a modified form at https://www.scientificsonline.com, and they still sell cool scientific gadgets that now stimulate 21st century imaginations.